Planning to make a career in Programming? Attend a hackathon first! When it comes to any field, experience counts. 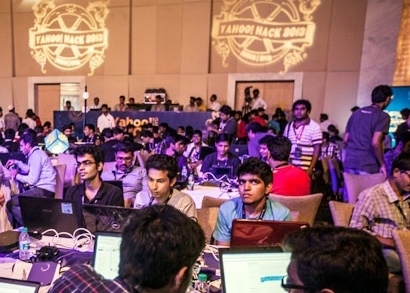 Hackathons are social coding events that bring together computer programmers, companies, and enthusiastic students to improve upon or build a new product. It’s about forming teams and building an app, website, or software to achieve a particular aim in a non-stop session that lasts for days. Much like internships, a hackathon is an experience of a lifetime for a newbie programmer. And so are the lessons, memories, and friends gained during this period. Here are some reasons why it’s a must for newbie programmers to drop into one of these Hackathons. 1. Secure an internship – Imagine a kid going from playschool to nursery. The transition is easier for him than for a kid directly joining nursery. Hackathons are that playschool for every programmer. Securing and surviving an internship is so much easier for someone with an experience of hackathons; after all, companies expect a fresher to have years of experience! Akshay, a 23-year-old student, understood this well in time. He participated in 4 hackathons in the last two years and landed an internship at an MNC! 2. Build your idea and show off – Whether it’s about applying what you learn or putting forward your idea, hackathons are the best platforms to do something worth bragging about. It gives you an edge over others by giving you a hands-on experience of how an idea is born, developed, executed, and achieved. The problems are often very practical and are clearly described in the statements. You can find some sample questions here. All you need is basic knowledge and a programmer’s perspective and you are good to go. 3. Spark up your resume – Yes, the certificate of winning a hackathon conducted by companies like CodeForIndia and Yahoo or even a participation in one conducted at various tech fests for companies like Google and Microsoft is meaningful. It can land you an internship at leading companies of the field. It adds a spark to your resume, and you get to explain your projects and experiences in the interviews. 6. Feel the pressure and learn from mistakes – Eat.Sleep.Code.Repeat. That’s the kind of adventure you’ll get yourself into. Hackathons often last from a day to a week. As a newbie, you are entitled to commit some basic mistakes. Sometimes the codes are complete mash-up of different languages, and sometimes you end up spending too much time on things that are not important. Whatever the mistake maybe, you learn and remember and avoid it in the future. It’s all about sleepless days, straining eyes on the screen, sleeping on the floor, and getting frustrated. Handling the pressure is yet another skill you learn and it’s the key to ace these competitions. This skill will also help you survive the toughest internships. 8. Get your hands dirty – Roll up your sleeves and get working because it’s time to get dirty. Yes, it’s all about the feeling you get when you work to create a meaningful software. It’s a place to try new technologies and approach every problem with an open mind and a new idea. Participate in the hackathons like Smart India Hackathon, IBM HackFest, and those organized by HackerEarth in association with different partners and you’ll realize the importance yourself. Nothing can be compared to the feeling of accomplishment you get when your code finally works – the hours of hard work you put in finally make so much sense. So what are you waiting for? Go register into one of those hackathons today and double your chances of getting these computer science internships. i am first year student of btech in cse and i am familiar with basics of C . can i apply? Do i have to pay any money for that and where should i register? Thank you for writing in. Yes, you can apply. Every hackathon has different specifications. You can check their website and see if there is any registration fee required. how can i register in hackathon? Every hackathon has a different procedure. You can register to it using your email id. What are the things I need to know for participating in a Hackathon?Please specify the details,I have gone through the skills section in the blog but didn’t get a single term.